Of the inhabitants of the al-Kadhimiya neighbourhood of Baghdad, Karar came from a family of Sadrist background and was born in 1986. His name is sometimes circulated in social media posts as Karar Abd al-Amir al-Fatlawi. He had no children. During the U.S. occupation of Iraq, Karar fought against the occupying forces, initially as a member of Muqtada al-Sadr's Jaysh al-Imam al-Mahdi. He then joined Qais al-Khaz'ali's splinter movement Asa'ib Ahl al-Haq soon after it was formed. Asa'ib Ahl al-Haq was formed in 2006, and so it is likely that Karar joined by the end of 2006 or beginning of 2007. However, Karar was not known to the Americans and so was not a wanted individual. Instead, he preferred that his work should be kept secret and not be publicised. Interestingly, Karar also enlisted in the new Iraqi army set up after the fall of Saddam's regime. Specifically, he became a soldier in the al-Muthanna Brigade affiliated with the 6th division of the Iraqi army. For some references to al-Muthanna Brigade from 2005 and 2006, see here and here. For reference to Karar's time in the Iraqi army in 2007, see here. Karar's speciality was sniper combat. On account of his affiliation with the al-Muthanna Brigade, he participated in operations in the Abu Ghraib and al-Karma areas to the west of Baghdad. In effect, the Iraqi army soldier Karar was moonlighting first as a member of Jaysh al-Imam al-Mahdi and then Asa'ib Ahl al-Haq. Therefore, it would have been all the more important to keep his work against the occupation secret. 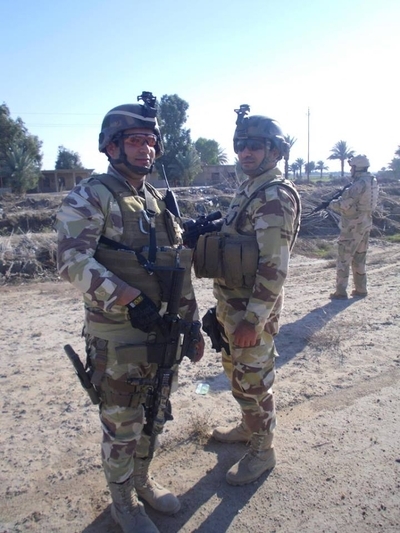 On left: Karar as an Iraqi army soldier. After the U.S. withdrew from Iraq at the end of 2011, Karar remained affiliated with Asa'ib Ahl al-Haq. In 2012, he set out to go fight in Syria. By this point he must have ended any involvement he may still have had with the Iraqi army, as he rejected the idea of returning to Iraq. Karar was part of an Asa'ib Ahl al-Haq contingent that went to fight in Syria. 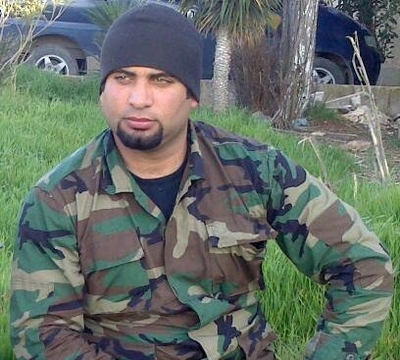 Two important figures in Asa'ib Ahl al-Haq involved in the group's mobilisation to fight in Syria were Mahdi al-Kinani (who was subsequently killed in Salah al-Din province in 2015 as part of the war against the Islamic State in Iraq) and al-Hajj Jawad al-Talaibawi. It has been asserted that Karar was a member of Liwa Abu al-Fadl al-Abbas, which was the first Shi'i group that became widely known for its involvement in the Syrian civil war. To be sure, there were some posts on social media that portrayed him as a member of Liwa Abu al-Fadl al-Abbas or implied that he was a member. However, the claim is actually incorrect. The misconception likely arose from the acclaim and renown that the name of Liwa Abu al-Fadl al-Abbas had acquired. It is also not the case that he was somehow first presented as a member of Liwa Abu al-Fadl al-Abbas and then retrospectively claimed as a member of Asa'ib Ahl al-Haq. From the outset, he was identified in other social media posts and on the ground as a member of Asa'ib Ahl al-Haq. Video posted on 3 April 2013 (shortly after news of Karar's 'martyrdom'). The video shows a parade commemorating Karar. The poster held up clearly identifies him as a member of Asa'ib Ahl al-Haq. 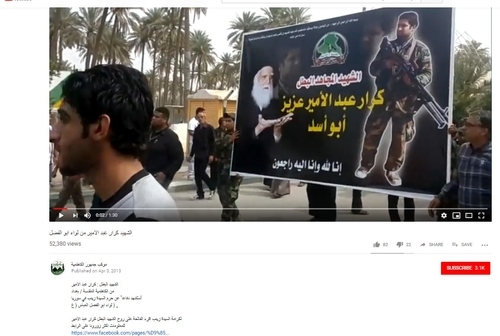 Although the video description mentions Liwa Abu al-Fadl al-Abbas, there is no mention or featuring of this group's name and symbols in the video itself. In fact, for the earliest stages of the involvement of Iraqi fighters in Syria, there were two distinct strands. One strand was Liwa Abu al-Fadl al-Abbas, whose main Iraqi leaders at the time were all notable for the fact that they were residing in Syria prior to the outbreak of the civil war. The other strand was an entity known as al-Quwwa al-Haydariya (The Haydari Force), composed of imported contingents of Iraqi fighters from Kata'ib Hezbollah, Asa'ib Ahl al-Haq and Kata'ib Sayyid al-Shuhada'. The Haydari Force had a direct relationship with Iran's Islamic Revolutionary Guard Corps and apparently had a wider scale of operations inside Syria beyond the Damascus area (e.g. Aleppo), in contrast with Liwa Abu al-Fadl al-Abbas (though, as Liwa Abu al-Fadl al-Abbas became a Syrianised formation affiliated with the Republican Guard, it did participate in fighting beyond the Damascus area). "We have worn the shrouds for decades. We have worn them for Lebanon. We have worn them for al-Quds [Jerusalem]. We have worn them for Iraq and its holy sites. Oh God, give victory to the Islamic Resistance in all parts of the world: Hezbollah Lebanon, Kata'ib Hezbollah, Asa'ib Ahl al-Haq and Liwa Kafeel Zainab (peace be upon him) the Haydari Force Asa'ib Ahl al-Haq from Iraq defending the shrine of al-Aqeela Zainab al-Kubra (peace be upon her)." The name Liwa Kafeel Zainab (Kafeel of Zainab Brigade) is also associated with Asa'ib Ahl al-Haq in relation to its Syria deployments at this time. Indeed, a reference to Liwa Kafeel Zainab and Asa'ib Ahl al-Haq appeared in a 6 April 2013 post on the page dedicated to Karar, as can be seen in the first screenshot below. The Ali al-Delfi music video 'Long Live the Resistance' from 2013- produced in support of defending the Shi'i shrines in Syria- features a reference to the Haydari Force: "Here is the Haydari Force you see it." Alongside it is a scene of a fighter with an Asa'ib Ahl al-Haq flag. In short, Liwa Kafeel Zainab can be seen as the development of Asa'ib Ahl al-Haq's contingent within the Haydari Force in Syria through the 2012-2013 period. It is to this strand of Iraqi fighters that Karar belonged, and not Liwa Abu al-Fadl al-Abbas. 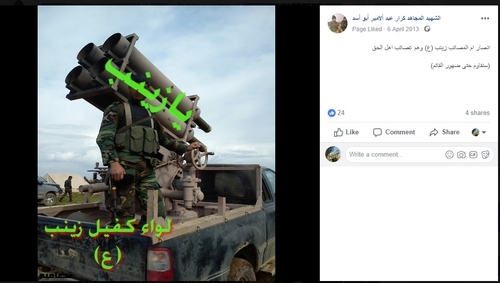 The social media profile for Liwa Kafeel Zainab likely arose as the numbers of Iraqi fighters deployed to Syria increased, with a perceived need for additional recruitment efforts and a need for a stronger pushback against the Syrian rebels. Similarly in this time period the likes of Kata'ib Hezbollah and Kata'ib Sayyid al-Shuhada' began promoting their presence in Syria. Karar himself was killed on 1 April 2013 in the Damascus area. There is an unconfirmed story that he died as a result of a firefight between Iraqi fighters of the Haydari Force/Liwa Kafeel Zainab and Syrian fighters of the Popular Committees. Apparently Karar had been trying to save another person who had been wounded, but Karar was then killed as a bullet struck his head.